An Assistant Engineers role is to ensure the smooth running of the clients’ time in the studio. This involves aiding the Engineer, setting up equipment/microphones logically and efficiently. A good technical understanding of every aspect of the studio is vital and as days can often last over twelve hours, being helpful, easy going and producing vast amounts of Tea can aid tired Producers/Engineers/Artists. As studios and technology has developed so to has the role of the assistant, but regardless of whether you’re using tape or the latest Mac, good people skills are crucial. The assistant takes care of the day-to-day tasks like getting lunch, fruit, milk, dinner, so that the engineer can get on with engineering and the artists/producer are as comfortable as possible. All sessions vary. Tracking involves managing of equipment, loading in and out, setting up microphones, pedals, guitars amps and essentially, helping the engineer get the sound they are after. Mixing involves patching in the outboard the engineer needs, making sure the recalls are up to date/accurate and any testing/balancing of equipment is done fast. An Assistant is expected to solve or work around problems quickly, be prompt, pre-empt the clients next move/requirement and carry it out efficiently. Today many engineers choose to work ‘in the box’, working purely from within the computer, bypassing the mixing desk and outboard gear. The major advantage of this is instant recall, the session can just be opened up, and it will be the same as when it was left. However, the majority of engineers take advantage of outboard and the mixing desk and usually request a recall of the mix to be done as part of the session. This means that the assistant must record, on paper or digitally, all the settings of the outboard and where they are used in the mix. Many large mixing desks, such as the Neve VR60 found in Miloco’s Engine Room and Musikbox studios, contain computers that operate the automation system and are also able to store the position of each switch, fader and knob on the desk. Although resetting each section of the desk is time consuming, this saves having to write down their positions on paper. Recalls are mainly used during mix sessions and the assistant will be expected to record a set of accurate, detailed recall sheets with the session sheet. Engineers may not be familiar with all of the different equipment in the studio and may occasionally ask for your opinion or input when choosing a piece of equipment. Eg, “I need a fast compressor, is this one good?”. 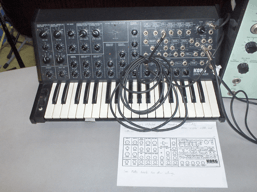 It is therefore good to have knowledge of all the outboard/synthesisers that the studio has on offer. 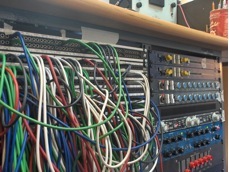 The patchbay is the point where all the audio signals meet. Every piece of equipment, the mixer, tie-lines and the multi-track travel to and from this point and can be connected via patch leads. Engineers will ask for various configurations of outboard, patched across different sections of the desk and it is the responsibility of the assistant to connect everything together using the patch leads. Multi-Track Although tape is still used for multi-track recording in studio, the vast majority of sessions now use digital sequencers such as Pro Tools or Logic. The role of an assistant in regards to controlling the multi-track, varies from studio to studio but a knowledge of the software and the operating system helps when solving any errors that occur. Conflict between plug-ins, sequencers, hard drives and the operating system can lead to software errors slowing progress. Testing the computer before the session as much as possible can help prevent this. 1. It doesn’t look impressive when an engineer asks what condenser microphones are available and the assistant is uncertain. 2. A lot of the microphones are very expensive and fragile. Ribbon microphones can be destroyed by phantom power where as condensers will not function without so extra thought is involved when plugging in. Engineers always select the microphones but as you build up a working relationship with someone you have worked with before they may leave an initial choice to an assistant, and then make final adjustments once the microphone is set up. You are expected to inform them which microphone is coming up on which channel/preamp and have it labeled clearly. Similarly, the scribble strip at the top of each fader on the mixer, should also be labeled so the engineer doesn’t have to try and guess what they requested on channel 11 over 46 hours ago. Often during a session the assistant may be asked to position a microphone. 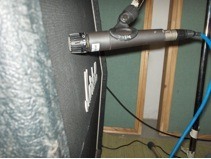 The type of mic may dictate how close to the source it can be placed. Ribbons are more delicate then a robust SM57, therefore care must be taken when placing them in front of a source with high SPL such as a kick drum or loud bass amp as this can damage them. Microphones and outboard are expensive, as are insurance pay-outs when someone trips over a carelessly laid cable. Run leads in a sensible and logical fashion with rugs or carpets covering areas where they must run across a main walking area. How you do this varies from session to session depending on the studio. For example, in Miloco’s innovative tracking room The Pool, extra care must be taken as the control and live room are one and the same, leading to open cable runs. Housekeeping Digital mediums are used more than tape, which means there is now the potential for huge amounts of audio data to amount over the course of a project. Each of these formats, whether it be CD, DAT, Hard drive or AIT need to be managed and backed up so that at any point they can be restored and sent for a re-mix or re-master. Secretarial skills are invaluable to the assistant as so much data amounts over the course of a project, that without clear and accurate labelling/filling it could poetically lead to an expensive mistake. The session sheet is where all information on the session is recorded. This includes studio time, assistant’s hours, faults, hired and borrowed equipment, backup information and any other extra costs. It is important that it is updated regularly throughout the session as, for example, it is then easy to look back on six months later and find what tracks you recorded in the first week or which guitar was rented to use on for “track four”. Every single piece of equipment at Miloco is logged in a database so it is easy to report any faults or find a specific microphone. This is very important as it allows for fast and easy communication between studio and maintenance staff, ensuring the studios remain in top condition. An assistant’s job involves a lot of long hours, not so glamorous tasks and you are almost certainly the first in and last out. However, this is relived by the vast amount of experience gained, the people you meet and the knowledge that you played a roll in the creative process.